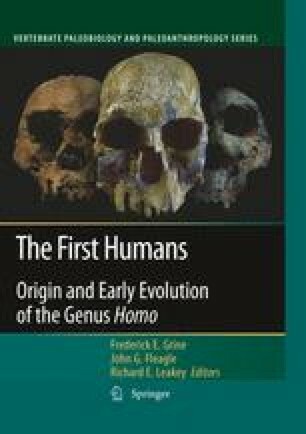 The evolution of diet in the earliest members of our genus, Homo rudolfensis, H. habilis and H. erectus has received increased attention over the past few years (see Ungar et al., 2006a for review). Many models have been constructed, based largely on nutritional studies combined with direct analogy (with living peoples or non-human primates) or on contextual evidence, such as archeological and paleoenvi-ronmental indicators. These models suggest hypotheses, some of which can be tested with the fossil evidence for the hominins themselves. In this paper we review and evaluate some recent models for the dietary adaptations of early Homo. While there are real intractable limits to what we can learn, the dental remains of these hominins offer some clues to the diets of these species. Results of a recent study on molar occlusal functional morphology (Ungar, 2004) will be reviewed, along with results from a recent study of dental microwear of early Homo (Ungar et al., 2006b). In addition, new data on dental microwear textures for early Homo cheek teeth will be presented for comparison with results for extant primates and other fossil hominins.